In the countryside of western Havana, during the fall, rickety yellow buses carry first-year medical students from the Latin American School of Medicine. Wearing short-sleeved white smocks and stethoscopes, they go door to door, doing rounds, often speaking to their patients in broken Spanish. “Even people whose houses I wasn’t visiting sometimes would ask me to take their blood pressure, because they just saw me in the street,” Nimeka Phillip, an American who graduated from the school in 2015, told me. The Latin American School of Medicine, or E.L.A.M., was established by the Cuban government, in 1999, after a series of natural disasters, including Hurricane Mitch, left vulnerable populations in Central America and the Caribbean in dire need of health care. This year, in the aftermath of hurricane season, hundreds of Cuban health workers, many of them E.L.A.M. graduates, will travel to some of the hardest-hit areas of the Atlantic to treat the injured and sick. All of the students who attend E.L.A.M. are international. Many come from Asia, Africa, and the United States. The school’s mission is to recruit students from low-income and marginalized communities, where they are encouraged to return, after they graduate, to practice medicine. In the U.S., black and Latino students represent approximately six per cent of medical-school graduates each year. By contrast, nearly half of E.L.A.M.’s American graduates are black, and a third are Latino. “You would never see those numbers” in the U.S., Melissa Barber, another American E.L.A.M. graduate, told me. Barber is a program coördinator at the Interreligious Foundation for Community Organization, in Harlem, which recruits American students for E.L.A.M. Applicants with college-level science backgrounds and the requisite G.P.A. go through an interview process with the organization. Those who make the cut are then recommended to E.L.A.M. The school accepted its first American applicants in 2001, a year after a delegation from the Congressional Black Caucus, whose leadership included Representatives Bennie Thompson and Barbara Lee, travelled to Cuba and held talks with the Ministry of Education about the need for doctors in rural black communities, and the financial obstacles that make it difficult for low-income and minority students to enroll in American medical schools. While some nations pay for their students to attend E.L.A.M., Fidel Castro decided that Americans, like Haitians and students from poor African countries, should attend for free. Since 1987, no more than six per cent of medical students in the U.S. each year have come from families with poverty-level incomes. Meanwhile, the cost of medical school has skyrocketed; the median student debt for the class of 2016 was a hundred and ninety thousand dollars. Phillip, a first-generation college graduate, worked multiple jobs and took out loans to pay for her undergraduate degrees in public health and integrative biology, at the University of California, Berkeley. She hoped to study “stress- and poverty-related illness” in medical school, she told me, but the cost of tuition, along with the pressure that would come from being one of the few minority students in her class, discouraged her from applying. After she graduated, she came across an online listing for an I.F.C.O. event in San Jose, while researching alternatives to medical school. At the event, there were a number of E.L.A.M. graduates who offered testimonials, but she remembered being moved by Luther Castillo’s story in particular. After graduating from E.L.A.M., Castillo returned to his Afro-indigenous village, in Honduras, and built the area’s first free, community-run hospital. Phillip was impressed by his story, and by E.L.A.M.’s philosophy of offering a free education for students who pledged to practice medicine in low-income, medically underserved areas. After she applied and was accepted, she braced herself for her six-year odyssey in Cuba. The child-mortality rate in Cuba is lower than it is in the U.S., and life expectancy in both countries is about the same, even though per-capita health-care spending in the United States is the highest in the world. In a certain way, Cuba has America to thank for this. The U.S.-imposed embargo and the dissolution of the Soviet Union led to an increase in the cost of medical supplies; facing a crisis, the Cuban government turned its attention to preventative care, seeking to eliminate much of the need for surgeries and expensive procedures by early detection. 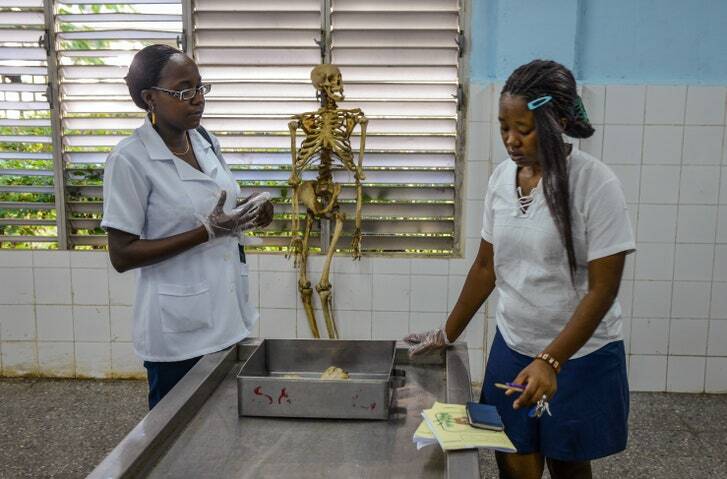 The vast majority of Cuba’s medical students go into primary care. Many of them take up posts in consultorios—doctor-and-nurse teams that live in the neighborhoods in which they practice. In the United States, more and more graduates are choosing specialties—cardiology, radiology, urology—over primary care, which pays less. Besides driving up the cost of medical education, this has also exacerbated physician shortages in rural parts of the country. Today, sixty-four million Americans live in areas where there is only one primary-care physician for every three thousand people. By 2030, according to a study commissioned by the Association of American Medical Colleges, the United States will be short at least forty thousand doctors, and perhaps as many as a hundred thousand. E.L.A.M. offered Phillip a chance to pursue medicine without incurring catastrophic debt. As she put it, she would graduate with the equivalent of car payments, while her peers in the United States would be saddled with the equivalent of mortgages. Although the school was lacking in creature comforts—the students slept in bunk beds; the hot water and electricity were unreliable; there was little access to the Internet or the phone—Phillip powered through. With help from family, friends, and an organization called Medical Education Cooperation with Cuba—which helps American students in Cuba prepare for their homecoming with scholarships, tutoring for U.S. exams, and connections to American medical networks—she returned home each summer, gaining experience at hospitals in Minneapolis, Oakland, and Washington, D.C.
Phillip said that her biggest challenge since becoming a doctor in the U.S. had been reading CT scans and MRIs, which are used sparingly in Cuba, and that she has had to adjust to spending less time with patients. Like many doctors of color, she has experienced moments of prejudice, from patients referring to her as “girl” to an incident with a young man wearing a Confederate-flag T-shirt. The Spanish she learned in Cuba does come in handy—the hospital holds regular clinics for migrant farm workers, in the local apple orchards and tomato fields.